Brazing under controlled atmosphere (the Nocolok® method) is a robust and reliable technology for joining metals for several industry sectors. Originating in the heat exchanger field, brazing was adopted by heat sink manufacturers in the early 2000s. Welding is the joining of two objects made of the same metal by locally heating the parts at a temperature higher than the melting point. 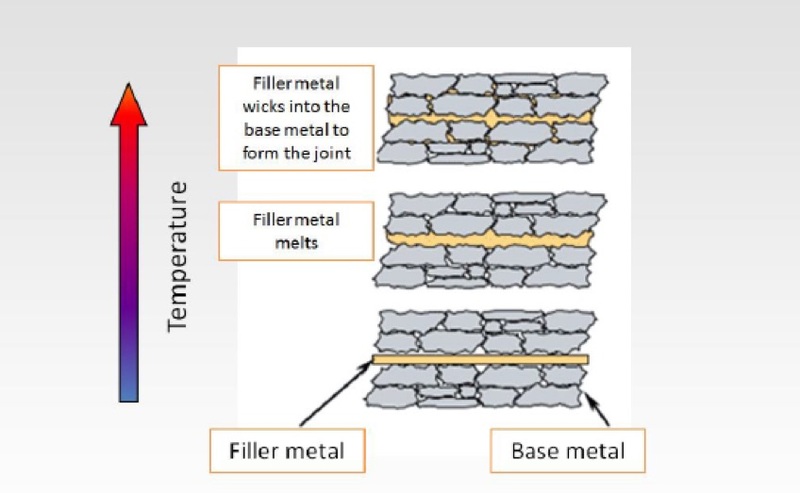 In some cases, a filler material must be added to the melting bath, compatible with the metal of the original parts, to fill the gaps created by the joint. With brazing it is possible to join different pieces of metal by making use of a filler material without melting the original parts. As a result, brazing technology is often suitable for joining large areas of components, compared to just points or relatively small zones and/or corners achieved with welding. The advantage of brazing is especially evident when the goal is to create a heat sink with an extended thermal exchange surface. Typically, a high-performance heat sink is made by positioning a high number of cooling fins on a base plate that is coupled to the heat source to be cooled. The base absorbs the thermal energy (heat) from the origin and, after spreading it on a larger surface, transfers it to the fins, which are often ventilated with forced convection air. In general, brazing also produces less thermal distortion than welding due to the uniform heating of a brazed piece. Complex and multi-part assemblies can be brazed cost effectively. Melting temperature slightly lower than the melting points of the parts to be joined. Surface wettability is promoted by a flux that is used to avoid oxidation. The parts are heated in specific ovens in which the atmosphere is filled (“controlled”) by an inert gas, such as nitrogen. This process is therefore called C.A.B., or Controlled Atmosphere Brazing. To achieve the desired results the following are crucial: correct preparation of components, use of proper jigs and tools, careful choice of oven and precise control of its parameters. It’s also very important for the design engineers to consider brazing starting from the early stages of the project; a clever manufacturing design can provide the end user with tremendous advantages in terms of reliability, performance and cost. 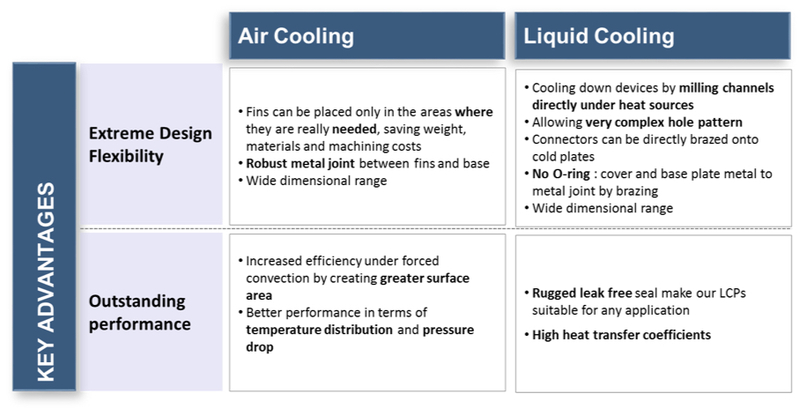 This technology also permits innovative cooling solutions for both air and liquid cooling by incorporating creative mechanical designs – which decrease size and weight, improve heat exchange, and reduce pressure drops in coolant fluid – and combining different metals such as stainless steel, which is very effective for Liquid Cold Plates. It is also important for brazed joints to comply with UNI EN ISO 18279:2005 Level C, which is requested for instance in railway applications. This international norm defines the joint quality in terms of percentage of occlusions (undesired materials), voids (porosities) and other parameters that can have a negative impact on the continuity and homogeneity of the junction. For an air-cooled heat sink ➜ mechanical strength of the joint — which must be able to resist shocks and vibrations, thermal cycle, etc. 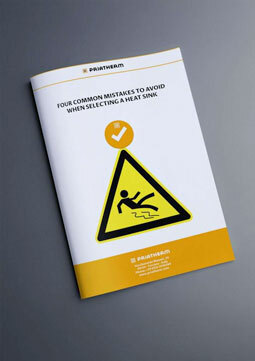 — and the thermal continuity for perfect heat transfer. When a complex thermal problem must be solved in power electronics applications, a high-performance heat sink and cooling solution is needed. Often standard aluminum extruded heat sinks or traditional assembled fin proposals are not enough to allow the power modules to reach their maximum performance in a safer mode. At this point the only creative, top-level solution is controlled atmosphere brazing technology. THE ONLY LIMITS ON THE DESIGN AND MANUFACTURING OF BRAZED SOLUTIONS ARE THE LIMITS OF YOUR IMAGINATION!